Preheat your oven to 350°F. Lightly grease a 9x13-inch pan. Place the beets in a blender or food processor. Puree until smooth. Combine the brownie mix, oil, eggs and pureed beets in large mixing bowl; stir until well combined. Stir in the chocolate chips. Pour the batter into your prepared pan and bake as directed on package - check after shortest recommended baking time. Remove from the oven and let cool. Serve slices lightly dusted with confectioners’ sugar, if desired. *Package sizes may vary according to brand. See the notes in my post above for dairy-free and even gluten-free suggestions. 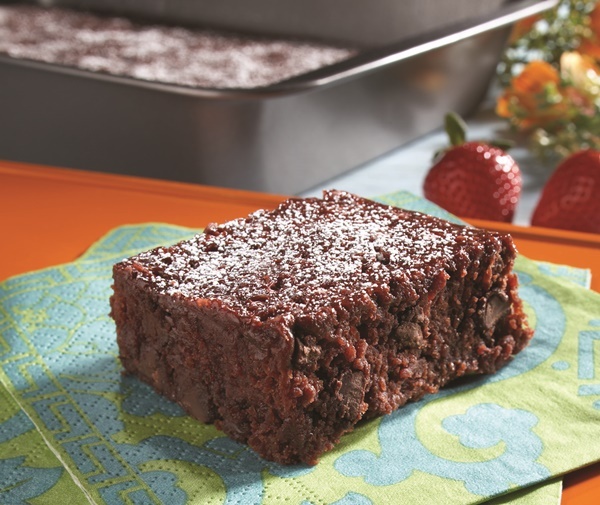 If you want a smaller batch, use just 1 box of mix for an 8x8-inch pan and half the remaining ingredients (half jar of beets, 2 tablespoons oil, 1 egg, ½ cup chocolate chips).